The Leitz Leicaflex is the father of all Leica R cameras. 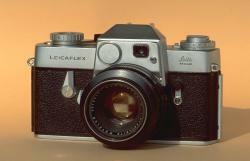 The first reflex made by Leica, the Leicaflex is the ancestor of the whole Leica R family. It has no auto-exposure mode but has a coupled light meter showing the right aperture/shutter speed combination in the viewfinder. Its mechanical shutter requires no battery : the battery is needed only to power the light meter. Built like a Panzer, it is immortal and can use all Leica R lenses. On the other hand lenses designed for this camera can't be used with later models.